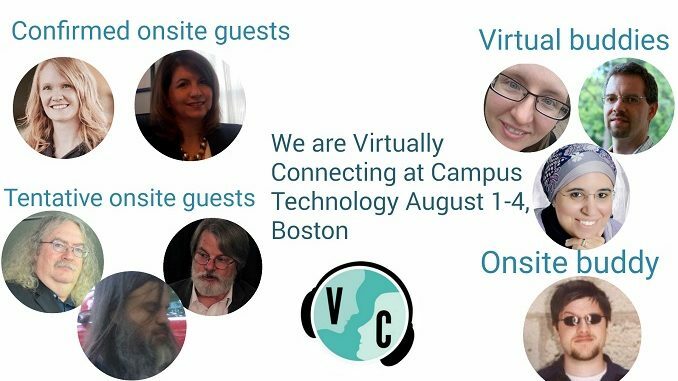 We will be adding more hangouts as we find times that work for other possible onsite guests: tentatively Stephen Downes hopefully joining us for the first time, and we are also hoping to connect with frequent VConnecters Bryan Alexander, Gardner Campbell, and George Station. And more! These sessions are preliminary for now and because of the spontaneous nature of Virtually Connecting all sessions can run a few minutes early or a few minutes late. In this session, Ken Bauer (virtually) and Apostolos Koutropoulos (AK, onsite) will facilitate a conversation with Amy Collier. In this session, AK will meet Bryan Alexander and George Station, with Ken Bauer hosting virtually. Bryan, by the way, is also holding one of his Future Trends Forums (#FTTE) via Shindig a little earlier, featuring Stephen Downes, among others. Details here. In this session, AK will meet Rebecca Peterson onsite, with Autumm Caines hosting virtually. Contact us to join any of the above hangouts.